The question mark over British policy seemed to be effectively removed in March and April by the guarantees to Poland, Greece and Rumania and the negotiations for an alliance with the Soviet Union. The United States contributed to this ‘peace front’ against further axis aggression. At the beginning of April the American fleet was moved into the Pacific to deter Japan, freeing the Western powers to concentrate their resources on Europe. An attempt was made to restrain Italy by making it clear to Rome that American sympathies lay with the democracies which would receive supplies from the United States in the event of war. In a series of public pronouncements the administration attempted to raise doubts in Hitler’s mind about American non-involvement in a European struggle. In April 1939 Roosevelt tried to alienate the German public from Hitler by proposing a just settlement which the Führer was bound to reject. 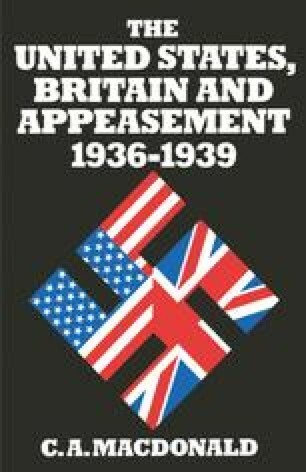 Despite such acts of solidarity with the Western powers, however, Washington was at first by no means convinced that Chamberlain had abandoned appeasement or that British policy was stiff enough to deter the axis. Scepticism was displayed about British intentions and the administration made attempts to add to British commitments, particularly over conscription, which ultimately proved successful.